In a recent post, I quoted Albert Camus who once said: “Autumn is a second spring when every leaf is a flower.” I adore the colors of FALL, especially those that occur naturally…browns, golds, moss greens, burnt oranges. Hence, the inspiration behind this post and this fall centerpiece for my kitchen island! Welcome to my Fall Kitchen Tour. When we gutted the kitchen in the home we bought three years ago, it was one of my goals to create a very neutral space. This way, I could easily transform the space for each and every holiday, season or event. Our kitchen features a 16-foot island, which I keep clear most of the time. However, as the “holiday season” comes upon us, I really try to take advantage of the space to decorate for the season at hand. Considering that my island is very large and has all white countertops, I enjoy using warm, neutral colors and materials to “soften” the starkness of it in these fall/winter months. Accordingly, I started with this fall centerpiece with this enormous wood serving platter! Finding it last season at West Elm for $89, I use it constantly. Next, I wanted to incorporate some height for the vignette and use something “natural”, so I grabbed these two wooden urns from my coffee tables. Click here to see them on my coffee table. Natural or organic elements…that could be flowers, leaves, branches, wood, etc. In this case, I cut off branches/leaves from a bush in my front yard that was changing colors. It made a huge impact in this design for sure! Glass…glass provides such a great contrast to natural elements. Candles…candlelight helps create such a wonderful glow that cannot be reproduced! A variety of textures…between the velvet, the glass, the candlelight, the leaves, and the natural pumpkins, the texture is running amuck in this vignette! I am crazy about these tiny white pumpkins, which I bought at Trader Joe’s for $.79 each! I bought the larger gold glass leaf votive candle holders on clearance at Kirkland’s about a year ago. I have used them in a variety of applications! ALWAYS head to the clearance section in any store. There are so many treasures to find! You can shop this whole look in the links I provided below. 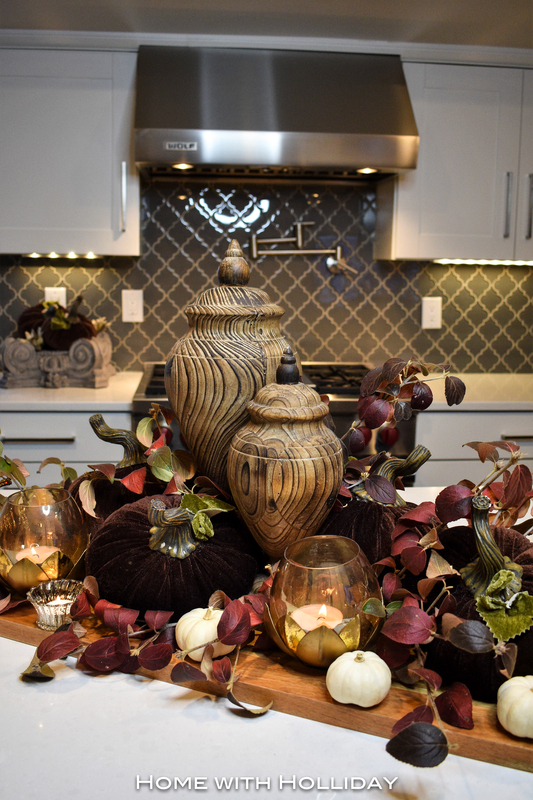 Next, I decided to incorporate the brown velvet pumpkins in other parts of my kitchen to tie it all together with my fall centerpiece on the island. I believe that blending the old and the new is part of what creates balance and character in a home. We are all a part of our past, our present, and our future. Over 20 years ago, I found this incredible antique corbel in a tiny antique store in McKinney, Texas when I still lived in Dallas. It has moved with me from home to home and it will always be a treasured part of any home we live in. It was perfect to feature for this Fall Kitchen Tour. Finally, you will see often that I love Apothecary Jars and I use them throughout my home regularly (more posts on that coming!!). When I am cooking, it is important for me to have the ingredients I use close by for easy access. Sugar, salt, and flour make it to the top of the list as I use them on a constant basis. It makes me so happy to get my sugar and salt from such pretty containers! Additionally, there are so many creative uses of Apothecary Jars. Check out my Pinterest page that contains many more ideas for the use of Apothecary Jars! Thank you for stopping by my first fall kitchen tour! Hopefully, you will consider subscribing to my blog so that you will receive instant email notification of new posts. Very beautiful I especially like the large wooden jars. Thank you Elisa! I do too! I move them around all the time for different applications.